Sri Padmavati Mahila Visvavidyalayam B.Ed(D.M) Admission Notification 2019, SPMVV Distance B.Ed Admissions, Women's University Distance B.Ed Course Admissions 2019: Sri Padmavati Mahila Visvavidyalayam, Distance Education Centre, Tirupati has issued B.Ed(D.M) Admission Notification 2018-19. 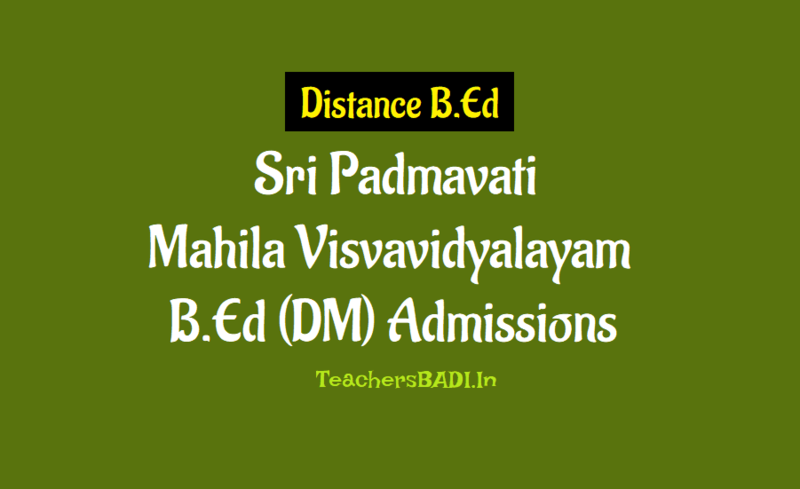 The Distance Education Centre, Sri Padmavati Mahila Visvavidyalayam, Tirupati offers Bachelor of Education Course for working women teachers in Andhra Pradesh, based on the norms of NCTE, besides other courses. The University invites applications from the eligible women teachers for admission into B.Ed(D.M) Course. Regular teachers with a Bachelor’s Degree serving in a recognized Primary/Elementary/ Secondary Schools having at least 2 years experience. Criteria V: Lecturers working in recognized Colleges/ Institutions. Teachers working in Government/Aided School should submit their service certificates and No objection certificate countersigned by the competent authorities at the time of admission. Those who do not have the Service Registers shall bring Service Certificate and the No Objection Certificate from the authorities concerned. Application and prospectus can be obtained from the Director, Distance Education Centre, Sri Padmavati Mahila University, Tirupati by sending a self-addressed, stamped envelope (Rs. 45/- for Registered post) of size 28cms x 13cms along with a Demand Draft for Rs.500/- on any Nationalized Bank drawn in favour of the Registrar, Sri Padmavati Mahila Visvavidyalayam payable at Tirupati with the name and address of the applicant written on the reverse of the draft, or by submitting the Demand Draft in person. Application can also be downloaded from the University website www.spmvv.ac.in. Applications received without service certificate and other required certificates cannot be counted. 5. Attested Copy of the Study Certificate of Intermediate and Degree / Residence Certificate for a minimum of 7 years of stay. About: The University was started in 1983 with the objective of imparting professional education to women in Andhra Pradesh and making them self-reliant. To this end the University offers courses which serve the dual purpose of academic excellence with applied orientation. The academic programmes of the University seek to develop in the students specific skills for gainful occupation, to create among them the awareness of work ethics and work culture and to motivate them for creative interaction with the society. The University is a statewide university. The seats are allocated in the ratio of 42:36:22 for Andhra, Telangana and Rayalaseema regions. The allocation for local areas and unreserved seats is as per Presidential Order, 1974. The University has entered into Distance Education mode from the year 2000-2001.